A network is a group of two or more devices that are connected to each other to share the data or share the resource. 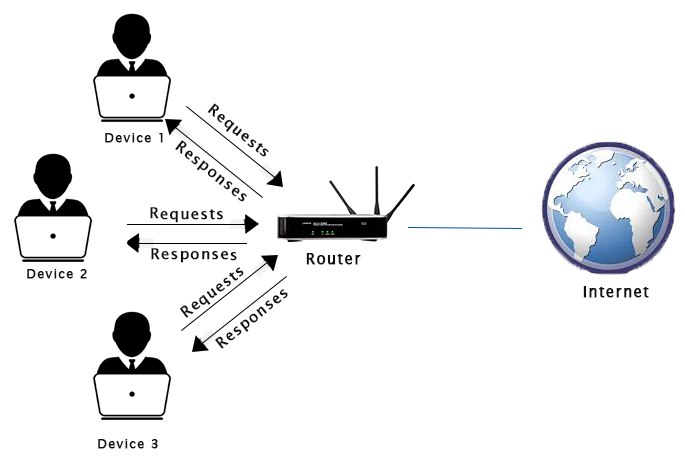 A network contains a number of different computer system that is connected by a physical or wireless connection like server or router. This router has direct access to the internet. The device can only connect to the internet through the router or access point. For example: Suppose the client or device connected to the network through Wi-Fi or Ethernet. If the client opens the browser and types google.com, then your computer will send a request to the router for asking google.com. The router will go to the internet and request google.com. The router will receive google.com and forward that response to the computer. Now the client can see google.com on the browser as a result. In networking, devices on the same network communicate with each other using packets. If you send a video, login a website, sending chat messages, sending email, all the data is send as packets. In networking, devices ensure that these packets go in the right direction using the mac address. Each packet has the source mac and destination mac, and it flows from the source mac to destination mac.